Charity from a little more than hold to fast three points, it seems only a short one and a half hours , but each of us embodies the effort . Before bazaar held , the students donated his beloved items, squadron members were busy painting posters. The bazaar was held at the time , teachers, parents , squadron members and captain have become charity 's staff is too busy. 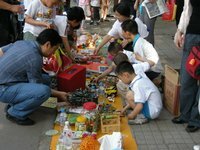 To help people snowstorm region , whether teachers or students are flocking to the site to buy charity bazaar goods are actively gave their love . When we see a wide variety of donated items , a wide range ; When you see a picture of the students pulled accumulate some money from his wallet long , I could not help but move : students how caring, how the family warm ! And then , as if to hear the people in the affected areas say "thanks" While charity event has ended, but this charity brings memories still engraved in my mind , it will also become the most valuable one recalls . No substantial amount of money to help people snowstorm region, perhaps because of a person's strength is so trivial , but ten , a hundred or even millions of individual personal strength is strong ! Students , teachers' enthusiasm and generosity deeply touched my heart there is a substantial and unprecedented from the meet . Lei Feng 's school the day before , although there are chilly , but our heart is still warm , our love will never be able to love in the same cool blue sky ! And we hope in a blue sky with people able to live a peaceful , harmonious and happy days !